I recently bought the compact box-set of Kino’s Journey. The website already has a long review of it (by Dave Baranyi), but I’d like to draw attention to it and add my own impressions. A youth rides a motorcycle through a desert. We soon learn that it’s a talking motorcycle, so this clearly is not quite the world as we know it. Nor are the rather allegorical countries Kino visits every three days quite part of the world as we know it. 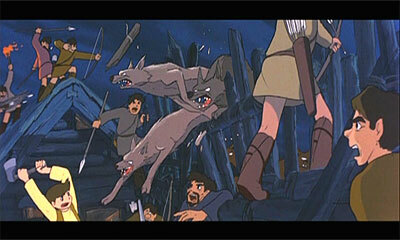 The producers of the anime have sought to give it a rather literary feel, in deference to the original books. In short this is a rather unusual anime, thoughtful, and well-crafted. To give a flavour of it, in an early episode Kino learns that the inhabitants of one country are living in isolation from each other, because somebody had the bright idea of altering the people so that they could read each other’s thoughts, a circumstance which they soon found utterly intolerable. In another, Kino is under-impressed by a local custom, which she later learns that the inhabitants had just invented and tried out on her in an effort to develop some traditions because they didn’t have any. Kino remarks that they do have a custom, but only so long as they don’t realise it. And some of the episodes are quite shocking. Not in the worst way, but shocking enough. Overall, though good, “Kino’s Journey” is rather downbeat and after watching a few episodes you might develop a yearning for something funny with cute magical girls in it. This is the debut feature of Isao Takahata (Grave of the Fireflies, Pom Poko) and is less known than the movies from the Studio Ghibli stable. It first appeared in 1968 (39 years ago!) and has recently been released by Optimum Asia. I was expecting some rather outdated “classic” and was pleasantly surprised that this movie exceeded my expectations. The dramatic opening sequence, in which the boy Hols fights off a pack of wolves and, losing his axe, makes a final stand atop a rock which turns out to be a slumbering Rock Giant, sets the marker for what is to follow. Hols, last survivor of a village destroyed by the frost demon Grunwald, takes refuge at a village threatened by Grunwalds’s magic. He befriends Hilda, a lonely girl with a beautiful singing voice, but falls out of favour with the villagers as Hilda is revealed to have a dark secret. The movie has impressive animation, well realised characters and settings, powerful and touching themes, and some fine music. Particularly pleasing is that the village seems to have a life of it’s own, including fish-drying and a wedding, and is not just a backdrop for the main action. Overall the movie seems surprisingly modern, and in fact I’d rate it above one or two of the more recent Studio Ghibli output. 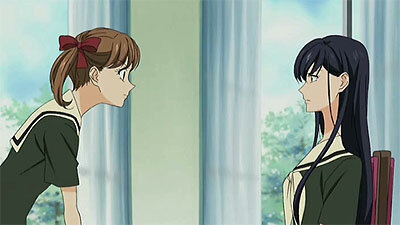 You’ve probably encountered the popular shoujo TV series “Maria-sama ga Miteru” – if not there has been plenty written about it elsewhere, and there’s a review on my website. 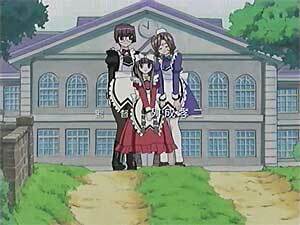 Now it has spawned a six-part OAV series, of which the first and second parts have appeared. OAV1 is a treat, as it opens with the main characters, Yumi and Sachiko having a girly squabble. The dialogue in this scene is a delight, and the faces seem drawn with a peculiar intensity. Yumi gets invited to rich-girl Sachiko’s summer residence, but has to contend with the ill-intentioned machinations of other girls of Sachiko’s circle who are jealous of Yumi because of her closeness to the alpha princess. Yumi’s simple honesty enables her to turn the situation around. 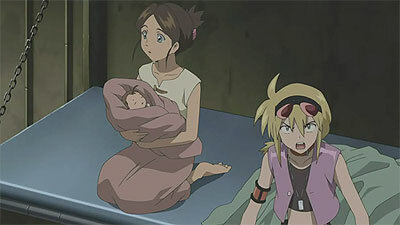 OVA2 was a disappointment for me, for the scenario seemed unconvincing, and the treatment weak. Essentially, the girls on the school council want to arrange some meetings with the council at a nearby boys’ school with whom they hold a joint school festival. They have a problem with Sachiko, who dislikes men so much that she can’t bear to be near a boy. I checked last night on a Polish TV website to see what anime was showing on Polonia1 (a satellite channel) in the early-morning slot. Nowadays there is little anime on satellite TV that would interest those who have access to digisubs, or subtitled anime DVDs. However the obscure low-budget channels from countries like Poland are the exception, for that is where the rare old stuff turns up, some dating form the ’60s and ’70s. Anyone seen “Magic Girl Tickle” (Majokko Tikkuru)? I thought not. It’s interesting to see this, both for the period animation style, and for the cultural values the animators bring to their work. This one has a scene where a disagreement about love-letters ends in a classroom riot where all the boys are trying to grab the girls’ breasts. Not quite what one would expect in an anime for schoolgirls! Also running, apparently, are “Yattaman” a long-running fantastic comedy, now forgotten, and “General Daimos” (Tosho Daimos) an old, but rather good alien invasion anime, which is full of cool stuff – aliens with angelic wings, inter-racial romance, giant robot battles, a flying city, robotic monsters, ugly aliens, never a dull moment. To get this material, you need to be in the satellite “footprint” (i.e. it’s above the horizon and in range), and have the right sort of digital satellite receiving gear. There is information in the satellite section of my website. A short 6 minute amateur anime by the CG artist calling himself “Imperial Boy”. Katari, a young girl who dreams of becoming a novelist, writes a love letter to a boy at her school. 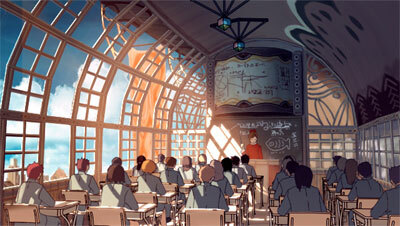 This is a remarkable anime with a vision of a quite different-looking world. 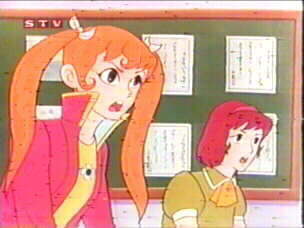 The clip shows a school classroom, with an arched ceiling and a video screen above the blackboard. The dialog is mostly in voice-over. 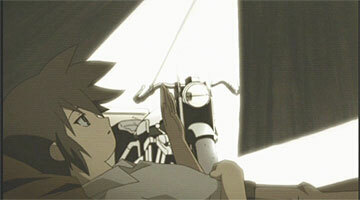 This short anime impressed me for its originality more than many a full-length pro anime. Watch this guy. Worth checking out Imperial Boy’s website, which contains some remarkable images, as well as his “Rain” page. Sakurada Jun is a disturbed junior high-school boy who never goes to school beacuse he is unable to socialise with his class-mates. Instead he stays in his room all day, ordering “weird” or “cursed” items over the internet. He lives with his more normal sister, Sakurada Nori. Their parents are absent. (This is quite common in anime, probably because it saves the trouble of having to draw them). One day Jun takes delivery of a weird doll, which is not just weird, it’s alive and thinks Jun is its servant! Jun’s life gets more disturbed as he is drawn into the world of the Rozen dolls and their sinister “Alice Game”. Soon Jun has three of the dolls in his house and is drawn into the life-threatening “Alice Game” battles. This is quite a good anime and if you ever found life-like dolls a but creepy it’s definitely for you. 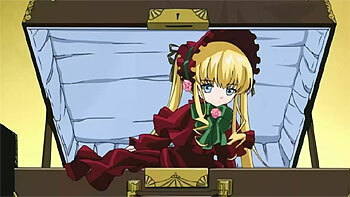 Jun’s relationship with the bad-attitude doll Shinku gradually becomes more complex. Consists of “Rozen Maiden” and “Rozen Maiden Traumend” – the latter is another 12 eps of the same, but with different credit sequence. The whole TV series is now licenced in the US by Geneon. It’s not without humour, for instance the characters quarrel childishly about cakes, and watch a TV puppet detective show in almost every episode.